The following 24 teams qualified for the 2003 FIFA World Youth Championship. 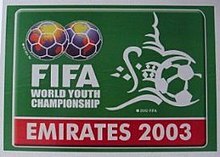 For a list of all squads that played in the final tournament, see 2003 FIFA World Youth Championship squads. The 24 teams were split into six groups of four teams. Six group winners, six second-place finishers and the four best third-place finishers qualify for the knockout round. 57 players with one goal.